The Obama strategist is now clean-shaven for the first time in 40 years, and his wife's epilepsy research non-profit is $1 million richer. 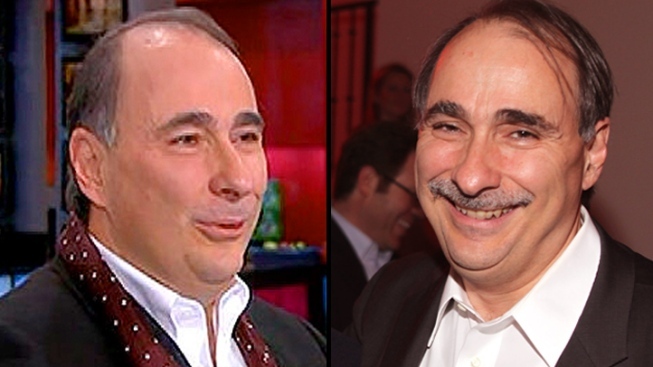 David Axelrod looked something like this for about 50 years — until 7:15 a.m. ET on Friday morning. David Axelrod has lost his signature mustache — for a good cause. President Barack Obama's senior strategist had his trademark feature shaved off on MSNBC's "Morning Joe" on Friday, in an appearance also broadcast on the "Today" show. But while Axelrod is now a few whiskers poorer, the epilepsy research non-profit his wife runs is now more than $1 million richer. "How are we feeling, David?" Joe Scarborough, host of "Morning Joe," asked him on the set of the political talk show. "Faint," Axelrod said from his seat in a barber's chair, with his wife Susan by his side. "I was up all night, to be honest with you," he added. After 40 years with his trademark 'stache, Axelrod had promised to shave it off if Susan Axelrod's organization Citizens United for Research in Epilepsy — a condition the couple's oldest child suffers from — could raise more than $1 million. By Friday morning, the group had raised $1,049,797, according to the campaign's website. Initially, Axelrod had made a bet with Scarborough over his facial hair concerning the presidential election, not epilepsy, promising to shave it off if Obama lost three key states. Scarborough was supposed to grow a mustache if he lost. Axelrod won that bet, but public interest in the possibility of his bare face had already been piqued. Scarborough skirted his end of the bet, and the threat of having to grow a mustache, by offering to donate $10,000 to epilepsy research if Axelrod shaved his anyway. The epilepsy fundraising drive reflected that interest. Donald Trump donated $100,000, while Obama, Carole King and 25,885 others also donated, according to Axelrod and his website. Trump, for one, said he felt his money was well spent and complimented Axelrod's new look, saying that it reminded him of his own father's. "I think he looks great," Trump said in a phone call into "Morning Joe."